1 Sheet Cut Outs Paper. Time for Love, Time with Dad, Time gone by, Time Flying By, It's all about Time with Bo Bunny's Timepiece collection. 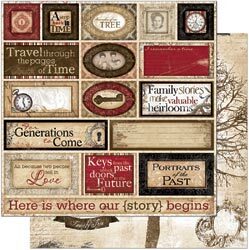 A great collection for family history. Full of elegance. Clocks for the past and the future.